Check out my mother’s homemade chicken broth recipe that has been passed down from generation to generation. Unlike most stocks, broths or bouillon cubes you buy at the grocery store, this base does not contain flavor enhancers or preservatives and you control the quantity of salt. Another bonus point is that store bought stock does not typically contain all of the nutrients and health benefits of homemade because of all the processing it goes through. If you love the taste of this chicken broth recipe then it will come in handy as a beverage on its own or a flavorful addition to many recipes. Low in fat and calories an eight oz glass has only 40 – 50 calories. 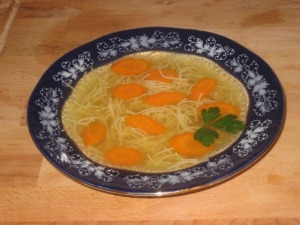 If you are pressed for time you can add some noodles and cut up the carrots that were cooked in the stock for a simple cup of soup. This will be a cup of soup that won’t leave you burping up the chemicals. As we know this stock is rich in minerals such as calcium, magnesium, potassium, collagen, gelatin, glucosamine and trace minerals which can be beneficial for joint health, digestive problems, immune system, cold and flu, hair and nail strength and the list goes on. Tips: Saffron gives the broth a beautiful golden yellow color. Place all chicken bones and vegetables into a large soup pot and cover with water. Add salt and place remaining spices into a spice ball and hang the ball inside of the pot ensuring that it is immersed in the water. Bring the soup to a boil, then lower the heat and simmer for about 3 hours. There is no need to cover the pot. As the soup simmers remove the foam that accumulates on top. Repeat this as necessary. Removing the foam helps keep the broth clear. Discard all bones and vegetables and strain the stock into a clean container. Hurray, now you have delicious homemade chicken broth that is preservative free to enhance the taste of many of your favorite recipes. Chicken broth lasts for about 4 days in the refrigerator. You can also freeze this delightful stock for future use in the right size containers that is suited for your family.